We recommend using MapQuest for directions to Winterthur, as we have found that Google Maps sometimes gives inaccurate directions. We are working with Google Maps to correct the problem. If you are using a GPS, please make sure that GPS directs you to Route 52/Kennett Pike and Winterthur Road, the front entrance to Winterthur. Please plan on arriving 45 minutes prior to your reserved tour time. This will allow time to check in and enjoy the Garden Tram. 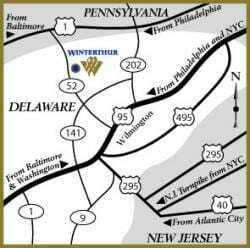 Buses should always come in the front gate of Winterthur, which is accessible from Route 52 (5105 Kennett Pike). Upon arrival, please stop at the Gatehouse (a small white building on the left) immediately upon entering from Route 52. A Winterthur Public Safety Officer will direct the bus as to where to check in, where you will be greeted by a Visitor Service Assistant. Please stay on the bus until greeted by a Winterthur Visitor Service Assistant. Please let the VSA know of any of your guests who may have mobility or accessibility issues, so that we accommodate those needs. Winterthur provides ample area for motor coach parking. At the fork in the road in front of the Visitor Center, turn right. Visitor Drop-Off and accessible parking is available at the Visitor Center. Vehicles with official permits may use designated parking spaces to the left of the Visitor Center and near the Galleries Reception Atrium. For more information on accessible parking and physical access to grounds and facilities, please contact the Winterthur Information and Tours Office at 800.448.3883, or click here.